After yesterday's story about wild grass used to produce clean fuel, let's look today at how corncob waste can be used to created carbon briquettes with complex nanopores capable of storing natural gas. These methane storage systems may encourage mass-market natural gas cars. In fact, these "briquettes are the first technology to meet the 180 to 1 storage to volume target set by the U.S. Department of Energy in 2000." They can lead to flat and compact tanks and have already been installed in a pickup truck used regularly by the Kansas City Office of Environmental Quality. After yesterday's story about wild grass used to produce clean fuel, let's look today at how corncob waste can be used to created carbon briquettes with complex nanopores capable of storing natural gas. These methane storage systems may encourage mass-market natural gas cars. In fact, these "briquettes are the first technology to meet the 180 to 1 storage to volume target set by the U.S. Department of Energy in 2000." They can lead to flat and compact tanks and have already been installed in a pickup truck used regularly by the Kansas City Office of Environmental Quality. And as the whole natural gas infrastructure exists already, this new technology could be soon adopted by car manufacturers. This technology has been developed at the University of Missouri-Columbia (MU) and Midwest Research Institute (MRI) in Kansas City, with a financial support from the National Science Foundation (NSF). 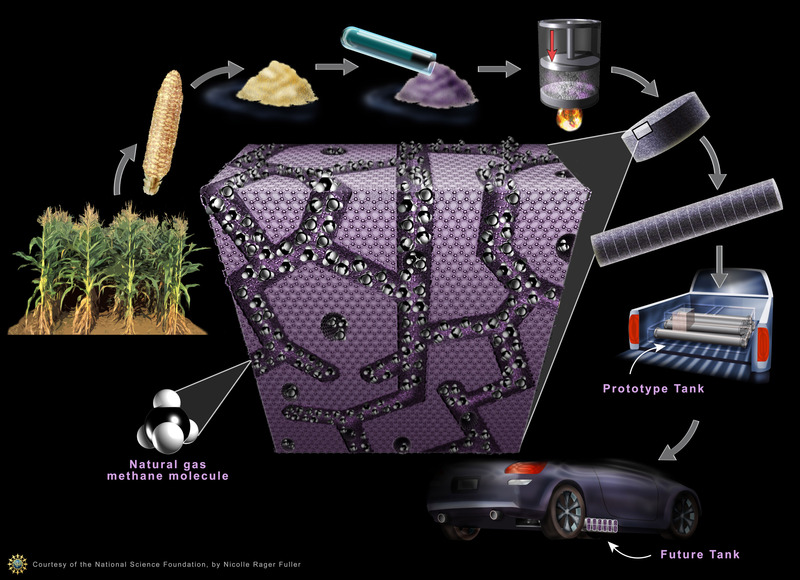 Below is an illustration showing the whole process, from the corncob to the pick up truck (Credit: Nicolle Rager Fuller, National Science Foundation). Here is how NSF describes this illustration: "Researchers at the University of Missouri-Columbia and the Midwest Research Institute in Kansas City have developed a method to convert corncob waste into a carbon 'sponge' with nanoscale pores. The new material can store large quantities of natural gas and can be formed into a variety of shapes, ideal characteristics for next-generation gas storage tanks on methane-powered automobiles." And here is a link to a larger version. Here is a comment from project leader Peter Pfeifer, professor of physics at MU. Here are more details about this project. In "Move Over Prius: Here Comes the Corncob Car," published by Red Herring on February 20, 2007, Andrea Quong adds more details. Corncobs, used to fashion the fuel storage system but not used for fuel themselves, are plentiful in the Midwest. By Mr. Pfeifer’s estimate, the state of Missouri could supply enough corncobs to fuel 15 million cars a year. And please note that this technology could be used today. "The whole natural gas infrastructure exists already," said Mr. Pfeifer, whose research was funded by a $600,000 grant from the National Science Foundation and a $500,000 combined grant from the University of Missouri and the Midwest Research Institute. "I really see no obstacles, technical or any other kind, except for peoples’ attitudes that [if something] isn’t visibly broken, why fix it." For even more information, you can read two other news releases, "From Farm Waste to Fuel Tanks" (NSF, February 16, 2007), from which the above diagram was picked, or "New Automotive Tank Holds Promise for Future" (University of Missouri-Columbia, February 16, 2007). Finally, I recommend that you read an article from the Columbia Missourian, "Breakthrough signals future low-cost fuel" (PDF format, 2 pages, 4.36 MB, June 8, 2006) which contains a very good diagram showing how these carbon briquettes are built.